Wild Pollinator Count – What will you see? There are more than 15 pollinators on this single flower (a Eucalypt) – including several native bee species, wasps, a fly and an ant. Which pollinators visit your area? I bet you said bees, right? European honey bees are great pollinators, but you might be surprised to hear they aren’t the only ones. Many other insects are pollinators too. 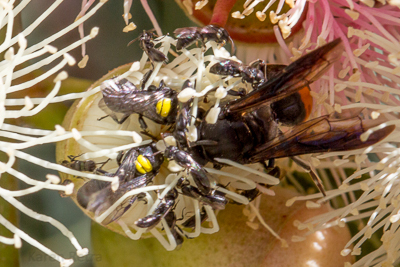 For example, across Australia there are around 2,000 species of native bees. They co-evolved as pollinators with our native plants. But they also pollinate introduced plants as well, including many of our foods. There are also several tens of thousands of beetle, butterfly, wasp, moth, fly, bug, thrip and ant species, some of which are documented pollinators. Unfortunately, there isn’t a lot of information known about many of these insects, including which flowers they pollinate, and where they are found. I’m involved in a project with Dr Manu Saunders, an ecologist at Charles Sturt University, that aims to raise awareness about these pollinators and to add to what is known about them. It’s called the Wild Pollinator Count and it’s been running all this week. We’d love you to join in. Here’s how it works. Choose a sunny day and find a flowering plant to watch in your garden or a public place. Watch for 10 minutes and note any pollinators that visit. There are some resources and a tally sheet on the project website to help you note which pollinators you see. If you don’t see many or any pollinators, that’s also of interest. When done, submit your observations via the online form. You can complete as many or as few counts as you like, on the same or different flowers. In my garden, some of my favorite and frequently spotted native bees have blue stripes (blue banded bees). There’s a huge variety of wasps, including the large yellow, orange and black hairy flower wasps (like the majority of wasps, they aren’t typically aggressive – the European wasps and paper wasps have given other wasps a bad reputation). I’ve seen at least six species of ladybird beetles. Hover flies are often mistaken for native bees, but are flatter, have big fly eyes and live up to their name by doing a lot of hovering above the flowers. All these and more are probably at your place too. I encourage you to spend a few minutes looking – you may be surprised by what you see. To find out more please visit wildpollinatorcount.com. Seed Savers Albury-Wodonga member Karen Retra wrote this article for the Living Lightly column that appears each Saturday in the Border Mail newspaper. This entry was posted in Member news by Karen Retra. Bookmark the permalink.